Element compositions, fatty acid profiles, lipid levels, and proximate compositions of marbled spinefoot and dusky spinefoot from Northeastern Mediterranean Sea/Turkey were evaluated. Amounts of K and P of both fish were calculated as the predominant elements among the 11 and followed by Na, Mg, and Ca in this study. Apart from the copper, micro elements composition did not change significantly in both species. Saturated fatty acids (SFA), polyunsaturated fatty acids (PUFA) and monounsaturated fatty acids (MUFA) levels were the predominant fatty acids in both species respectively. Linoleic (n6) acid and linolenic (n3) acid levels were significantly higher in dusky spine foot than marbled spine foot. The ratio of DHA/EPA in marbled spinefoot and dusky spinefoot were calculated as 3.58 and 1.82, respectively. 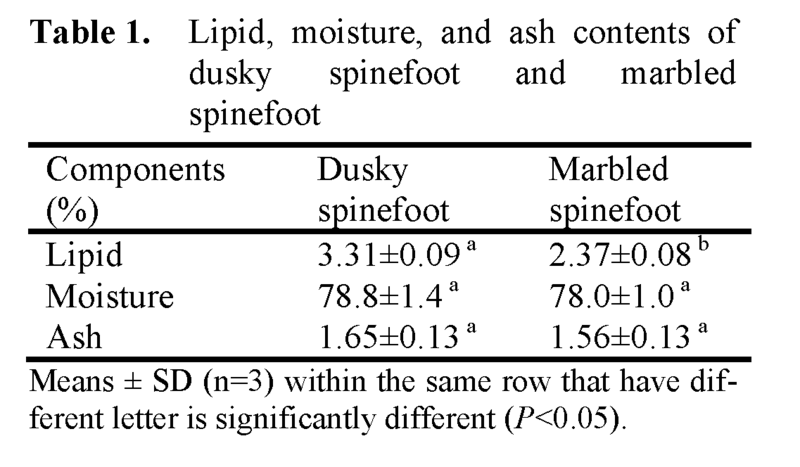 Lipid content of dusky spine-foot was significantly (P< 0.05) higher than that of marbled spine-foot, although moisture contents of both fish were almost the same. Marbled spinefoot, light brown-olive, longitu-dinal yellow stripes on each side, and dusky spi-nefoot, body changes from mottled olive-green to dark brown at death (Torcu and Mater, 2000) are two successful lessepsian migrant fish species. These two species draw attention and are consi-dered to be economically important (Torcu and Mater, 2000) fish species due to its delicious taste, considerably low fat content and affordable prize comparing other fish species with very similar visual attributes. Containing most of the 90 naturally occurring elements, fish are good sources of elements. The greater portion their body consist of carbon, hy-drogen, nitrogen, oxygen and sulphur. In addi-tion, six macro elements (calcium, magnesium, phosphorus, sodium, potassium, and chlorine) are present in gram per kilogram quantities. The re-maining elements occur in the body in much lower concentrations (mg or per kg) and called microelements (trace elements; iron, zinc, cop-per, manganese, iodine, cobalt, nickel, molybde-num, chromium, fluorine, etc) (Lall, 1995). Ma-cro elements are required in our diets in amounts greater than 100 mg, and the microelements are required in milligram quantities or less per day (Nabrzyski, 2002). Fish is generally consumed in almost every part of the world, whether which has a way to the water or not, by humans because it has high pro-tein content, low saturated fat and also contains omega fatty acids known to support good health in very different ways. This fact has been sub-jected to many studies and described well enough in too many articles. That is why it is not be de-tailed these beneficial here. Though two commercially important lessep-sian migrant species, marbled spinefoot and dusky spinefoot belonging to same family in the Northeastern Mediterranean Sea/Turkey, are found in the Mediterranean and consumed along the region, limited information are available about them. The aims of this present study were to search mineral contents, fatty acid profiles, and proximate compositions of marbled spinefoot and dusky spinefoot and also to find out differences between the two species. Both dusky spinefoot and marbled spinefoot were captured by a local fisherman in the coast of Iskenderun Bay (Northeastern Mediterranean Sea/Turkey). The samples were obtained in March 2008 and analysis was carried out as soon as samples were received. After transferring the fish to the laboratory, they were gutted, filleted, and minced. The sam-ples were minced using with a laboratory type blender. Sampling was done in triplicate for each group. EEC recommended oven drying method ISOR 1442 (Commission of European Communities EC, 1979), modified Bligh & Dyer Method (Hanson & Olley, 1963), and A.O.A.C., 35.1.14 (2000) method no 938.08 were used to determine the moisture, crude lipid, and ash content of both fish species, respectively. Separation of FAMEs was carried out as de-scribed in Oksuz et al. (2009). Fatty acid methyl ester of fish lipid was injected to Hewlett Packard HP 6890 series GC coupled with HP 6890 Mass Selective Detector. Injector was set to automatic mode and injection volume was 2 micro litres on split mode with a split ratio of 1/50. Separation of total fatty acids was achieved in 31 minutes. The identification of individual fatty acids was carried out by comparing those retention time of FAME standard (Supelco 47085U PUFA No: 3) and Supelco 37 component Fame mix (47885-U). Confirmation of FAME was also performed by using a MS data base library (FAMEDBWAX). The wet ashing method was used for digestion of organic matter. This procedure was carried out according to (AOAC Method 975.03) with a mi-nor modification. Fish flesh (2 g) was weighted into a polypropylene screw capped tube and 10 ml of 65% HNO3 (Merck, Darmstadt, Germany) were added to the sample, followed by the addi-tion of 3 ml of 60 % perchloric acid (Merck, Darmstadt, Germany). Samples were left over-night to complete digestion. Further heating was then carried out in a hot water bath at 90°C for 6 hours. Digests were filtered into a 25 ml volume-tric flask, using ash-free filter paper and made up to 25 ml the volume with ultra pure water. The determination and quantification of min-eral elements were done by ICP-AES (Varian Model- Liberty series II). Calibration curves for each of the individual elements were prepared from ICP Multi element stocks (Charleston, SC 29423). The phosphorus standard solution was prepared by dissolving KH2PO4 (Merck) in ultra pure water to obtain a 1000-ppm stock phospho-rus standard. The standard stock solution was then acidified (100 μl/100 ml) with 65% HNO3. Data were subjected to analysis of variance (ANOVA) and mean comparison was carried out using Duncan’s test. Statistical analysis was per-formed with SPSS 15.0. Significance was estab-lished at P<0.05. The lipid, moisture, and ash content of mar-bled spinefoot and dusky spinefoot are shown in Table 1. The level of lipid content of dusky spi-nefoot was found significantly (P <0.05) higher than that of marbled spinefoot with the value of 3.31% and 2.37%, respectively. Those values are found higher than those reported for Siganus ri-vulatus in March by Saoud et al., (2008) and Saoud et al., (2007).The amount of moisture content in marbled spinefoot and dusky spinefoot were calculated very similar to the each other (78.1 % and 78.8%, respectively). These similar-ity were found statistically not significant (P >0.05). Saoud et al., (2008) were reported that level of moisture in dusky spinefoot was found to be 79.11% in March which is slightly higher than that of marbled spinefoot in this study. This diffe-rentiation could be the results of different loca-tion. Ash contents of marbled spinefoot and dusky spinefoot were found to be 1.56% and 1.65%, respectively. These values are very close to each other and found statistically not significant (P >0.05). Spawning season of both marbled spinefoot and dusky spinefoot are supposed to be from April to August in the Mediterranean (Torcu and Mater, 2000). Therefore, both of the fish were supposed to be out of spawning period since they were caught in March. The FA composition of dusky spinefoot and marbled spinefoot are shown in Table 2. A total of 20 FA for both fish species were identified in this study. The determination of the fatty acid compositions of dusky spinefoot and marbled spinefoot were performed by GC-MS. The com-position of saturated (SFA), monounsaturated (MUFA), and polyunsaturated fatty acid (PUFA) of dusky spinefoot were found to be 38.62%, 26.15%, and 35.23%, while those of marbled spi-nefoot were found to be 45.76%, 22.94%, and 31.18%, respectively. The SFA levels in marbled spinefoot were found higher than that of dusky spinefoot whereas the MUFA and PUFA level of marbled spinefoot were present in low levels. The major FA identified in both fish species were palmitic acid (C16:0), oleic acid (C18:1 n9), pal-mitoleic acid (C16:1 n7), arachidonic acid (C20:4 n6, ARA), docosahexaenoic acid (C22:6 n3, DHA), and eicosapentaenoic acid (C20:5 n3, EPA). The SFA levels of dusky spinefoot and mar-bled spinefoot were found to be the highest among all fatty acids. This result may be attributed to the effect of fish digestion. The average level of C16:0 in marbled spinefoot (32.64%) was found to be higher than that in dusky spinefoot (28.20%). Similar results were noted in the terms of C16:0 for muscle of Siganus fuscescens, another spinefoot species, by Osako et al., (2006) and the level of Siganus luridus (the same fish species studied in this study) in March by Saoud et al., (2007). The levels of stearic acid (C18:0) and C14:0 in both fish species were found to be very close to each other (P>0.05). The rest of the SFA components in both fish species were in lower amounts. The MUFA component of both fish species in this present study were differed from each other. These differentiation were found statistically not significant (P>0.05). The level of C18:1 n9 and C16:1 n7 were the predominant fatty acid in edible part dusky spinefoot and marbled spinefoot. The amount of C18:1 n9 in marbled spinefoot was found higher than that of dusky spinefoot with the values of 16.17% and 15.80%, respectively. Osako et al., (2006) reported that the level of C18:1 n9 in muscle of Siganus fuscescens was found to be 11.7% in March which is the same month that both fish species caught in. The value of C18:1 n9 is lower than that of both fish species in this study. However, the level of C18:1 n9 in muscle of Siganus fuscescens in May (Osako et al., 2006) was found exactly the same as that of C18:1 n9 in dusky spinefoot in March in this study. The PUFA level of dusky spinefoot was found to be higher than that of marbled spinefoot (P>0.05).The DHA in both fish species was cal-culated as the highest percentages in all PUFA content. Osako et al., (2006) and Saoud et al., (2007) were reported similar result for Siganus fuscescens and Siganus luridus, respectively. Ad-ditionally, the level of EPA in dusky spinefoot was found to be statistically higher than that of marbled spinefoot with the value of 4.34% and 2.36%, respectively (P<0.05) in the present study. The levels of ARA in both fish species were found surprisingly higher than those of EPA. In addition, the level of ARA was calculated as 5.96% and 7.42% for dusky spinefoot and mar-bled spinefoot in this study, respectively (P<0.05). Furthermore, the levels of ARA in March for Siganus fuscescens and Siganus luri-dus by Osako et al., (2006) and Saoud et al., (2007) were calculated lower than those in the two fish species in this study. However, their re-sults about higher level of ARA are in parallel with our findings. Moreover, having a higher level of ARA than that of EPA could be a dis-tinctive feature for Siganidae family. The percentage of Σn3 PUFA in dusky spine-foot (21.41%) was found higher than that of mar-bled spinefoot (18.42 %). The value of Σn3 PUFA in Siganus fuscescens in March (Osako et al., 2006) is similar to that of dusky spinefoot in this present study. The amount of Σn6 PUFA in dusky spinefoot (12.16%) was also found higher than that of marbled spinefoot (10.44%). Both of these values are lower than that reported by Osako et al., (2006) for Siganus fuscescens in March (16.8%). 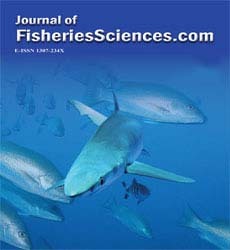 The ratio of Σn6 : Σn3 were cal-culated as 0.57 for both fish species examined in this research. This value is lower than that re-ported by Saoud et al., (2007) for Siganus luridus in all months they studied. Element compositions of marbled spinefoot and dusky spinefoot were shown in Table 3. A total of 11 elements was analysed in the edible part of both fish species. As it can be observed from the Table 3, mineral contents of both fish are mostly different from each other, except ra-tios of Mn (manganese) and Cd (cadmium). Al-though significant (P < 0.05) differences existed between marbled spinefoot and dusky spinefoot only in levels of Cu (copper), no significant (P >0.05) differences were noted in the rest of the element contents studied in this research. Almost no Cd, a toxic element, was deter-mined in both fish species in this study. This is a good sign for a raw food material. In addition, the average level of Cr (chromium) marbled spine-foot was found to be 0.30±0.10 mg/kg. Even though this value is found a little bit higher than that previously determined for muscle of Siganus rivulatus from the coastal waters of EL-max Bay by (Abdallah, 2008), it is still in a very low amounts. On the other hand, the level of Cr dusky spinefoot was found to be 0.09±0.07 mg/kg which is lower than that of marbled spinefoot in this study and that reported by (Abdallah, 2008) for the same fish species. The level of Mn calculated in both fish spe-cies in this study are the same with each other. This value is lower than in muscle of Siganus ri-vulatus from three different locations (Kress et al., 1999). In addition, the amount of Cu and Zn (zinc) in flesh of marbled spinefoot and dusky spinefoot in this study differed from each other. However, only the levels of Cu between two spe-cies were found statistically significant (P< 0.05). The levels of Cu and Zn in muscle of mar-bled spinefoot were found higher than dusky spi-nefoot in this research. These finding are far be-low previously determined in both of the same fish species by (Abdallah, 2008). According to Kress et al., (1999) the levels of Cu and Zn in muscle of marbled spinefoot at Haifa Bay were reported similar to those determined in the cur-rent study. The level of Fe (iron) in muscle of marbled spinefoot (8.65 mg/kg) was found lower than dusky spinefoot (9.66 mg/kg) in this research. Compared to Kress et al., (1999) findings, the levels of Fe in muscle of marbled spinefoot at Ardag and Observatory were found higher than our finding. Fe is one of the essential trace ele-ments and should be in daily diet. Fe supplied in the diet must be in the range of 15 mg/day in or-der to meet daily requirement (Belitz et al., 2004). 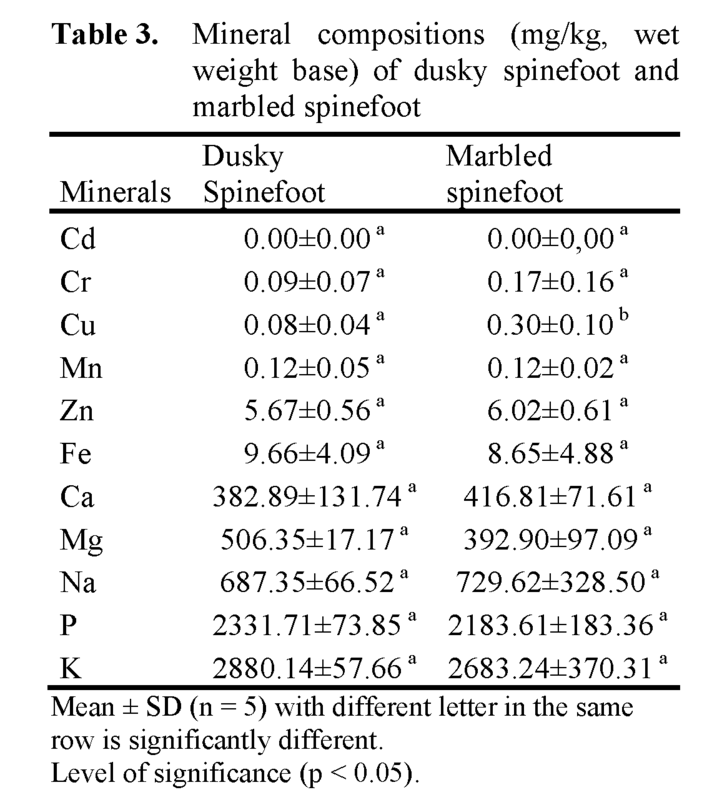 The levels of K (potassium) and P (phospho-rus) in the edible portion of marbled spinefoot and dusky spinefoot were the most abundant minerals, followed by Na (sodium), Mg (magne-sium) and Ca (calcium). The amounts of K and P in the flesh of dusky spinefoot (2880 and 2331 mg/kg, respectively) were found to be higher than those in the flesh of marbled spinefoot (2683 and 2183 mg/kg, respectively) (P>0.05). In addi-tion, fish are a good source of P (Lall, 1995), which is directly involved in energy-producing cellular reactions. On the other hands, K regu-lates the osmotic pressure within the cell, is in-volved cell membrane transport, and activation of some enzymes (Belitz et al., 2004). Although the quantity of Mg in the muscle of dusky spinefoot was found to be higher than that of Mg in muscle of marbled spinefoot with val-ues of 506 and 393 mg/kg, respectively, the difference between two fish was not statistically significant (P>0.05). Even though Mg toxicity is rare, an adequate intake of magnesium has some useful roles in a human body due to the fact that it provides nutrition, regulates enzyme systems, helps to maintain bone health, is required for energy metabolism, and acts as a part of the pro-tein-making machinery in all cells of soft tissues (Whithney & Rolfes, 2008). The amount of Ca in marbled spinefoot (417 mg/kg) was found to be higher than that in dusky spinefoot (383 mg/kg) (P> 0.05). Ca is an essen-tial mineral which must be added to diet. The amount of recommendation for Ca is (RDA) 800 mg/day. Ca involves in the structure of the mus-cular system and controls essential process like blood clotting, activity of brain cells and growth (Belitz et al., 2004). The level of Na in the edible part of marbled spinefoot and dusky spinefoot was found to be 730 and 687 mg/kg, respectively. In addition, no significant (P<0.05) the differences was found in the terms of Na content of both fish species stu-died in this research. The levels of ash and moisture were found very similar while those of lipid content differed in both fish species in this current study. How-ever, based on their lipid content both species may be considered as a low fat fish. In addition, the two fish species were rich in unsaturated fatty acid in particular to PUFA such as, DHA, DPA (22:5 n3), ARA, and EPA. Moreover, the levels of P and K in both fish species were found most prevelant macro elements, followed by Na, Mg, and Ca. Based on these results, the two lessepsian migrant fish species seem to be a good source of macro elements, especially P and K. Microele-ment contents of the S. luridus and S. rivulatus were almost the same except Cu. The amounts of Cu were found in the range of the provisional to-lerable daily intake amounts based on recom-mended by FAO and WHO for a 60 kg person (FAO/WHO, 1999). Belitz, H. D., Grosch, W., Schieberle, P. (2004). Food chemistry. ISBN 3-540-40817-75. Springer-Verlag Berlin Heidelberg, Ger-many. Hanson, S.W.F., Olley, J., (1963), Application of the Bligh and Dyer method of lipid extrac-tion to tissue homogenates, Biochemical Journal, 89: 101-102. FAO/WHO, 1999. Joint FAO/WHO. 1999. Ex-pert committee on food additives. Summary and conclusions. 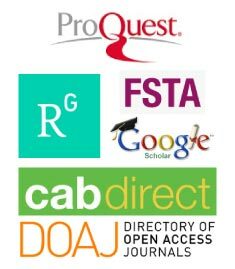 In: 53rd meeting, Rome, 1–10 June. Kress, N., Herut B., Shefer E., Hornung H. (1999). Trace element levels in fish from clean and polluted coastal marine sites in the Mediterranean Sea, Red Sea and North Sea, Helgoland Marine Research, 53: 163-170. Lall, S. P. (1995). Macro and Trace Elements in Fish and Shellfish. (Ed.A. Ruiter ) In: Fish and Fishery Products: Composition, Nutri-tive Properties and Stability, CAB Interna-tional, Wallingford, pp. 187-214. Nabrzyski, M. (2002). Mineral Components and functional properties of food components, Sikorski, Z. E., CRC Press, Florida, chapter. 4. Öksuz, A., Özyilmaz, A., Aktas, A., Gercek, G., Motte, J., (2009) A Comparative Study on Proximate, Mineral and Fatty Acid Compo-sitons of Deep Seawater Rose Shrimp (Pa-rapenaeus longirostris, Lucas 1846) and golden Shrimp (Plesionika martia, A. Milne-Edwards, 1883), Journal of Animal and Veterinary Advances, 8(1): 183-189. Osako, K., Saito, H., Kuwahara, K., Okamoto, A. (2006). Year-round high arachidonic acid levels in herbivorous rabbit fish Siganus fus-cescens tissues Lipids by AOCS Press, 41 (5): 473-489. Torcu, H., Mater S. (2000). Lessepsian fishes spreading along the coasts of the Mediterra-nean and the Southern Aegean Sea of Tur-key, Turkish Journal of Zoology, 24: 139-148. Whithney, E., Rolfes, S. R. (2008). Understand-ing nutrition (11th ed.). West Publishing Company, MN (USA), pp. 410.